For most individuals, divorce is such an emotional and stressful time, that even thinking about how to begin the process can be overwhelming. At the Law Office of Rosanne Klovee, LLC, we serve clients in Stoneham, Woburn, Burlington and Middlesex & Essex County in Massachusetts. We can help you determine when is the right time to formally begin the process as well as help relieve some of the anxiety that is expected and understandable during this difficult time. Below is information to help you know what to expect at the beginning of the process so that you can overcome your fears and put yourself in the right hands. If you have any questions, do not hesitate to call Rosanne Klovee, an attorney who concentrates solely in family law matters with over 17 years of experience. In Massachusetts, the filing process involves either a Complaint for Divorce or a Joint Petition for Divorce. A Complaint puts you in the court system immediately so you have a case number, are assigned a judge, and can go to court as needed. Attorney Klovee’s goal is always to try to reach an agreement on all issues but if this is not possible, or you need to obtain orders from the court, filing a Complaint allows the case to move through the court system in a timely manner. Filing a Complaint for Divorce does not mean that you will necessarily have to go through a contested trial. Even when both sides agree that a divorce is necessary and believe they will be able to resolve their case short of a trial, there are reasons why a client should file and be under the umbrella of the Court right away. Attorney Klovee spends the time necessary upon meeting with her clients to explain and understand whether filing a Complaint immediately is necessary. She also thoroughly explains the option of filing a Joint Petition for Divorce if that makes sense for the individual client. A Joint Petition for Divorce means that spouses have resolved all issues in their divorce before ever stepping foot in a courtroom. There are some cases in which neither side wants or needs the court involved in their decision making process. Attorney client, whether as a mediator, or as an advocate for her clients, will work with you to resolve your case and prepare all of the paperwork needed for you to get divorced through a Joint Petition. Once all of the paperwork is complete, you will still need to go to court for an uncontested divorce hearing. The most common grounds for divorce in Massachusetts is Irretrievable Breakdown of the Marriage, which is a no-fault ground for divorce. There are faults grounds such as cruel and abusive treatment or adultery. Attorney Klovee will explain the pros and cons of filing on fault grounds so you can make an informed decision on which grounds you wish to file on. If you file a Joint Petition for Divorce, the grounds will be Irretrievable Breakdown of the Marriage. In addition to a Complaint for Divorce or a Joint Petition for Divorce, there are other forms that will need to be filed with the Court. You will also need a certified copy of your marriage certificate which you can obtain from the town hall in the city/town in which you were married. The paperwork will be filed in the division of the Probate & Family Court that is appropriate for your case. Our team will assist you with all filing requirements and you will make the decision as to when you wish to file after discussion and advice from our office. Once the paperwork has been filed, the clerk will provide a Summons. This official paper will formally notify your spouse that the Complaint has been filed and that an Answer to your case must be provided. There are options as to how to serve your spouse. In some cases, having a constable knock on the door and surprise your spouse is not the best way to start the process of divorce. 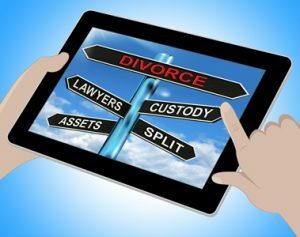 In some cases it is necessary and Attorney Klovee will take the time needed so you can make an informed decision as to what is the best way to notify your spouse that you have made the difficult decision to initiate divorce proceedings. Attorney Klovee is always cognizant that to the extent possible, children should not be present when a spouse is served with a divorce summons. Overall, the process of divorce can be confusing and hard to understand. When you are filing in Massachusetts, use the resources provided by the Law Office of Rosanne Klovee, LLC to ensure that your proceedings are handled correctly, and that the tone you wish to proceed under is established at the beginning of your case so you can work toward your goals and get through this difficult phase of your life. Contact our office today and we will help you get started.